Recently the Heard Museum has been energized as The Mural Project: Cheyenne Randall embellished the campus. Like many of the murals that grace the walls of buildings around Phoenix, this public art project is eye-catching and thought-provoking. Larger-than-life images now adorn the buildings, attracting attention as the artist, Cheyenne Randall (Cheyenne River Sioux), raises questions about representation and identity. 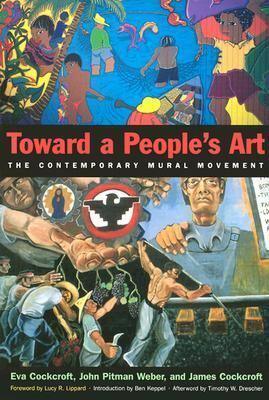 As public expressions of art, murals have played many roles throughout history. Here are four selections from the library collection that showcase this artform in recent times making social commentary with captivating oversized imagery. These examples of various mural projects are currently on display in the public reading area of the library. Please feel free to visit the library to review these or any other items of interest in the Library and Archives collections. For more details or additional collection information, click on the link labeled Library Catalog Search located in the pull-down menu of the library tab on the Heard website.